This time last year I was sitting in a Leeds library for what felt like the 100th day in a row, pounding away at my keyboard and trying to convince myself not to drink Red Bull for breakfast tomorrow (no matter how many words of my dissertation I promised myself I’d write by the end of the week). This time last year I was most definitely not anticipating sitting on the judging panel for the Bruntwood Prize for Playwriting. As a recent graduate I spend a lot of time checking and rechecking the ‘jobs and opportunities’ pages of many arts organisations across the region. Upon finding the call out to recruit a People’s Judge for this year’s Bruntwood Prize my brain said ‘…I think I would really enjoy that, why not apply’ – and so I did. I was shortlisted, sent a new piece of writing from a previous winner and was asked to produce a script report on it. These reports were anonymised and sent to well known theatre critic Lyn Gardner, who chose the ‘winner’. On reflection, there’s a lot to be said for ‘why not apply’, particularly in an anonymous process where you have almost absolutely nothing to lose. You never know where you might end up, so why not apply? As the People’s Judge I represent the theatre go-er and speak on behalf of the audience (no pressure!). I have always been completely in love with new writing for theatre as I see it as an incredibly powerful social tool. Through new writing for theatre we can learn about ourselves, each other and the world around us. We can understand why the sky is blue, but we can also explore what would happen if it were purple, green, or yellow. My first big event as the People’s Judge was attending the Bruntwood Prize launch at the Young Vic, where the competition opened for submissions. A real highlight of this day for me was getting to meet most of the other judges for a chat about why we are excited to be on the panel and what we are looking for in the entries this year. As a group we have great synergy in our passion for new writing whilst leaving enough diversity in taste to make this an exciting judging process. I also really enjoyed getting to tell my mum that I was being ‘sent to London for an industry event’, and of course drinking prosecco. Although the evening reception was somewhat overwhelming, being my first proper networking event, I did enjoy meeting so many friendly people from different parts of the industry and the energy in the room was a buzz of pure excitement! As part of my time as the People’s Judge, I am being mentored by Lyn Gardner who is helping me to develop my skills in reading and discussing scripts – rather than fully formed productions – and viewing work with a critical eye. 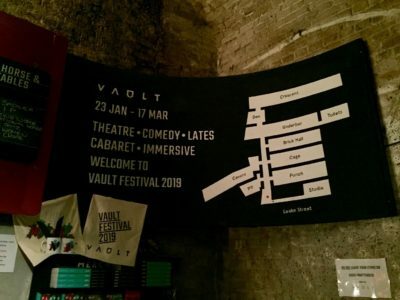 We recently spent a weekend together in London where we visited the Vault Festival – an eight week long festival of work from emerging artists held in the railway arches underneath Waterloo Station – and The Gate Theatre – tiny in size yet enormous in artistic opportunity – and the Trafalgar Studios – my first ever West End experience. The shows, all of which were new writing, were incredibly varied in their form, development, budget, and content. Each piece transported me to a world or situation I had not yet explored. 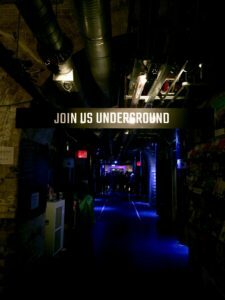 Attending five shows across two days is my idea of a perfect weekend, and I always enjoy seeing and talking about theatre with another person who also loves to see and talk about theatre. So spending the weekend with Lyn was fantastic! When we weren’t chatting about the shows we had just seen, of which there were many interesting thematic ideas and exciting theatrical concepts to unpick, we spent time discussing the social value of interacting with the arts and cultural activities and in what ways we can truly measure the ‘success’ of a project. As a creative person at the beginnings of my professional career it is quite easy to become disheartened with living out the minimum-wage-job-you-hate-but-can’t-afford-to-leave-yet rhetoric. However my conversations with Lyn allowed me to gain new perspectives on the journey of establishing oneself within the creative industries and I am beginning to feel more in control of my professional future (for this I am very grateful!). There is something quite special about interacting with a play through reading its script, rather than seeing it as a fully formed production. When reading a script you are essentially able to be one-on-one with its writer, able to experience the play on its most raw and initial terms. By the time a script reaches the stage we can expect many subjective impressions and interpretations to have influenced the product viewed by an audience, from directors, designers, actors etc. But when interacting with a piece in script form we are able to isolate the writer’s understanding of its characters and their world, which is a rarity in the business of theatre and performance. Throughout the year I am looking forward to widening my experience with different types of scripts. Despite what we may think, there are no rules when writing and this is what makes new work for the theatre so exciting! As the People’s Judge, I hope to encounter some scripts that challenge my directorial eye, pieces that push me to expand my creative skills as a theatre maker were I to stage the piece. I would also like to read scripts that teach me something new about people I don’t often get to hear from. New writing for the theatre can be a powerful socio-political tool and I hope to see it in action.